Big brother is redundant… @codepo8 ▪ Everything we do online is monitored and recorded ▪ We often don’t realise that our data is how we pay for “free” services ▪ We’re happy to use systems that record all the time in exchange for convenience ▪ Often people don’t realise just how dangerous this can be in the wrong hands. Everything counts in large amounts @codepo8 ▪ We create a massive amount of information – actively and without our knowledge. ▪ It is tough to make that amount of information consumable again. ▪ That’s why we have computers ▪ With cloud computing, on demand processing and advances in hardware we’re faster than ever. Leaving invisible marks… @codepo8 ▪ By using other people’s machines and infrastructure, we leave traces ▪ This allows companies to recognise us, and accumulates a usage history ▪ This leads to better results, but can leaks data ▪ We should have more transparency about what digital legacy we left behind. Machines can be great tools or weapons… @codepo8 ▪ Machine Learning is all about returning assumptions ▪ We don’t get any definitive truth from algorithms, we get answers to our questions ▪ AI can answer questions, but it is up to you to ask good questions – generic questions yield assumed results. Humans ▪ Messy and prone to mistakes ▪ Forget things and filter them by their biases Bots and computers… ▪ Make no mistakes, other than physical fatigue ▪ Never forget, don’t judge ▪ Bored when doing repetitive tasks ▪ Great at tedious, boring tasks ▪ When bored create more errors ▪ Repeat things with minor changes on iterations till a result is met ▪ Non-optimised communication, lots of nuances and misunderstanding @codepo8 ▪ Highly optimised, non-nuanced communication. Humans Bots and computers… ▪ Messy and prone to mistakes ▪ Forget things and filter them by their biases ▪ Bored when doing repetitive tasks ▪ When bored create more errors ▪ Non-optimised communication, lots of nuances and misunderstanding @codepo8 Data Insights Patterns ▪ Make no mistakes, other than physical fatigue ▪ Never forget, don’t judge ▪ Great at tedious, boring tasks ▪ Repeat things with minor changes on iterations till a result is met ▪ Highly optimised, non-nuanced communication. Computer Vision @codepo8 ▪ When text wasn’t cool enough, we added images to our web media ▪ Often we forget that not everyone can see them, and we leave them without alternative text ▪ This is where machine learning steps in to help turning an image into a dataset we can work with. 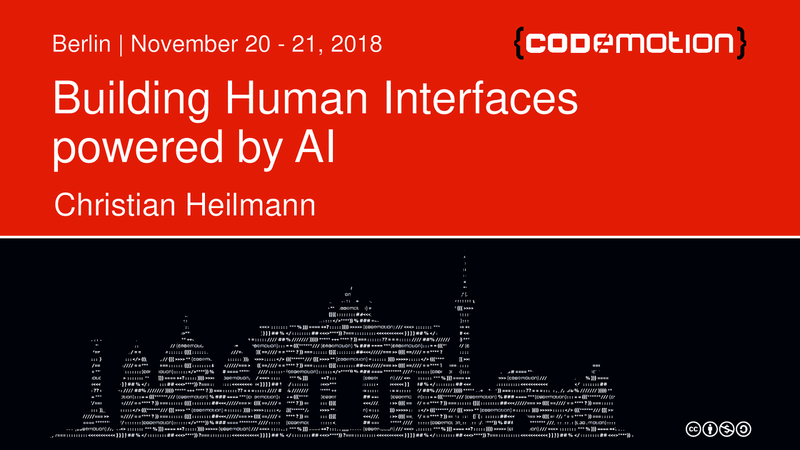 Our responsibilities.. @codepo8 ▪ AI can be an amazing help for humans ▪ It does need transparency – if you use people as data sources, they need to know what and where it goes ▪ When people get information filtered by an algorithm, it should be an opt-in ▪ People need to have a chance to dispute when an algorithm tagged or disallowed them access. View Building human interfaces powered by AI on Notist. I love the fact that @codepo8 showed many examples of AI products built by women at @CodemoBerlin. Great way to promote diversity! On my way back from @CodemoBerlin, I spent 6 hours on the train toying around with a machine learning idea. Mostly doing data cleansing and plumbing around #BigQuery. Haven't gone very far but having tons of fun. Thanks so much for all the inspiration @codepo8 and @thiagoavadore!